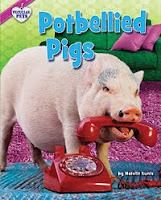 Peculiar Pets is a new series by Bearport Publishing. 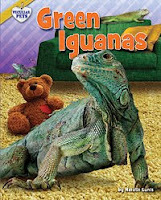 The four-title series currently covers iguanas, pot-bellied pigs, miniature horses, and ferrets. I got my hands on Green Iguanas and Potbellied Pigs, both by Natalie Lunis. Full of color photos and interesting facts, these books will appeal to kids who have or want these unusual pets. The books give some tips about the care of these animals, though potential pet owners will want a more in-depth manual before deciding to obtain one of these pets. These books would make great companions for kids who are not confident enough at reading to make it through a pet-care manual. Another new series by Bearport is X-Moves, books about extreme sports. 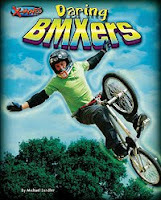 Included in this series are books on BMX, surfing, snowboarding, skateboarding, MotoXers, and rally cars. I read Super Surfers and Daring BMXers, both by Michael Sandler. Again, I love the layout of these books. They're full of cool color pictures showing people doing tricks in their sports. The text is simple and with a pleasing layout that includes small fact boxes and captions for the photos. I think this series will appeal most to kids who are already interested in extreme sports and it's likely to attract sports fans who don't read much. Happy Nonfiction Monday! Simply Science has the roundup, so go check it out.